This package includes a Two Dog Tow Line and Two Dog Neck Line. Made with two lines of 1" (2.54 cm) durable tubular nylon with 16" (40 cm) of high quality cold weather bungee inside the two sections in the nylon to absorb sudden tension and jerks on your dog's harness. The Tow Line includes a brass snap on each line section to attach to the back of your Ultra Paws� dog's harness with a loop at the combined end to attach to your Ultra Paws� Skijor Hip Belt or sled. Each section of the Tow Line also features a hand loop near the brass snap to shorten the Line for better control of your dogs when walking or stopped. 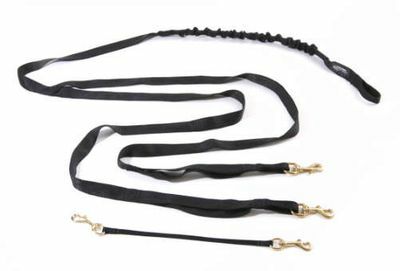 A Two Dog Neck Line is included to run two dogs side by side in 3/8" (.9 cm) nylon webbing with 10" (25.4 cm) between the half inch (1.27cm) brass snaps.